You probably never thought you'd lose all your data stored on iPhone 8 one day, which is uncommon in your subconscious mind; exactly on the contrary, it is however a frequent event that is easily caused due to system crash, iOS upgrade, virus attack, jailbreak, factory reset or a series of possible and unexpectable situations. Fact is that a simple 3rd-party iPhone data recovery, designed with advanced data retrieval technology, can work for you to recover data from iPhone 8 with high success rate. Wonder know which one it is or how it performs? Keep reading following content in the way you like. 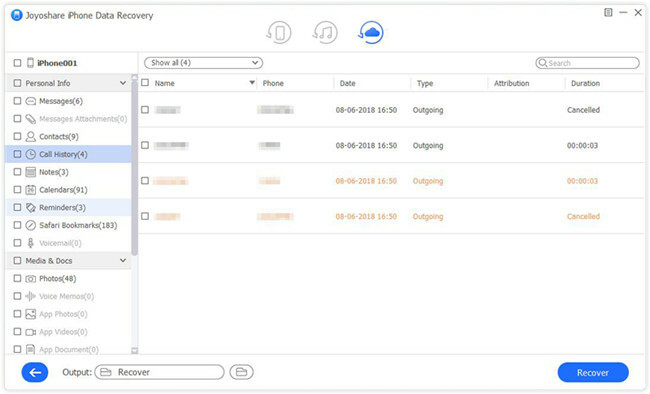 Here which tool we are going to talk about is Joyoshare iPhone Data Recovery, a versatile and trustworthy tool that you can draw support from. It is committed to recovering data from a huge array of iOS devices (iPhone/iPad/iPod touch), including the newest iPhone XS/XS Max/XR/X/8. Alternatively, it also has ability to extract data from iTunes or iCloud backup, aiming at keeping all current data intact to minimize unnecessary loss. By means of this brilliant software, you are allowed to restore not only common but also encrypted files, such as photos, contacts, notes, reminders, videos, Safari bookmarks, Kik/WhatsApp/Viber messages, etc. 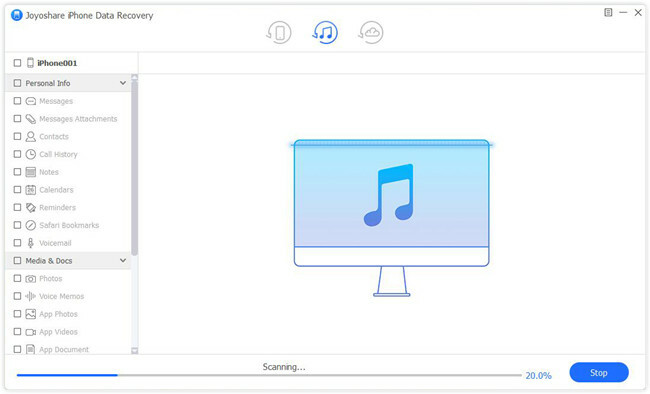 Furthermore, Joyoshare iPhone Data Recovery also makes it possible to preview scanned data in real time and selectively choose desired items before recovery. Most important of all, its amazing searching and retrieving speed can strikingly save you much time and improve working efficiency. 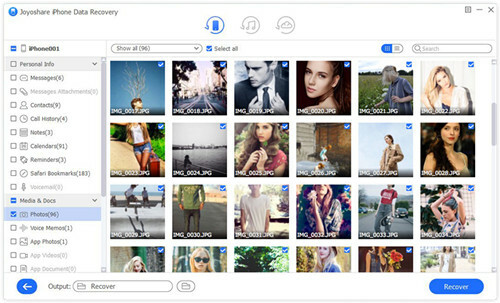 Joyoshare iPhone Data Recovery simplifies the whole data recovery process with its uncluttered layout and intuitive icons. If you have no both iTunes and iCloud backup from iPhone 8, you should concentrate on following guide seriously. Navigate to Joyoshare Software Download Page here to download and install Joyoshare iPhone Data Recovery. Run it to finish connecting iPhone 8 with the computer under "Recover from iDevice" mode. Do remember to click "Trust" option on iPhone if you are asked to trust the computer. After success connection, Joyoshare will show both deleted and existing data types in your sight, with which you can select designated files. Or go straight to click "Scan" button without changing all default options. 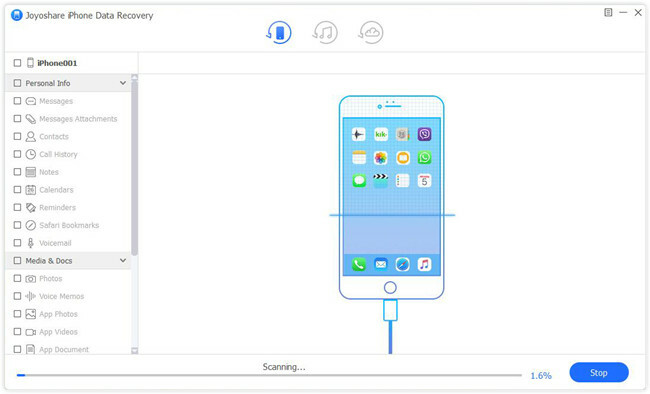 Once Joyoshare iPhone Data Recovery complete scanning data from iPhone 8, you will be led to see all recoverable files in ordered list. According to your preference, you can filter out needless data by choosing "Only show the deleted" option or searching file name on the search box. When get what you want ticked, go for pressing "Recover" button on the right bottom. It is well-known to all that iTunes comes with ability to back up iOS data manually or automatically. The one who has synced iPhone 8 data before data loss can benefit from the second solution as below. 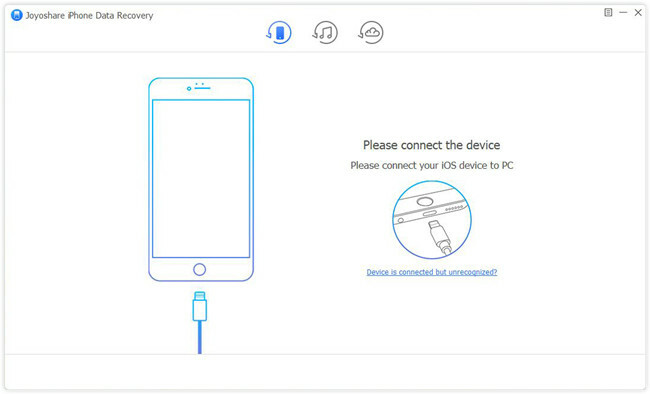 Open Joyoshare iPhone Data Recovery and this time you ought to firstly switch the recovery mode to "Recover from iTunes" on the top menu bar. 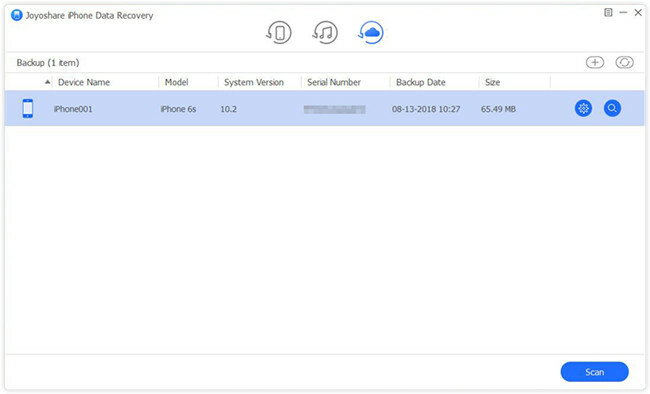 Excellently, Joyoshare iPhone Data Recovery will detect all iTunes backups from your computer's local folder right away with related detailed info attached. Select the recent one you think will contain the data you need, after which hit the gear icon on its right side to further confirm data type, like "Photos", "Contacts", etc. Then simply tap on the "Scan" button. Wait until the scan process ends and continue to look through all results in your own way. You can check the categories in left column or tick specific items after preview. To output them on computer, just go forward to click the "Recover" button now. Likewise, iCloud is also capable of backing up iPhone 8 data as long as you have enabled "iCloud backup" option on your iPhone settings before losing/deleting data. 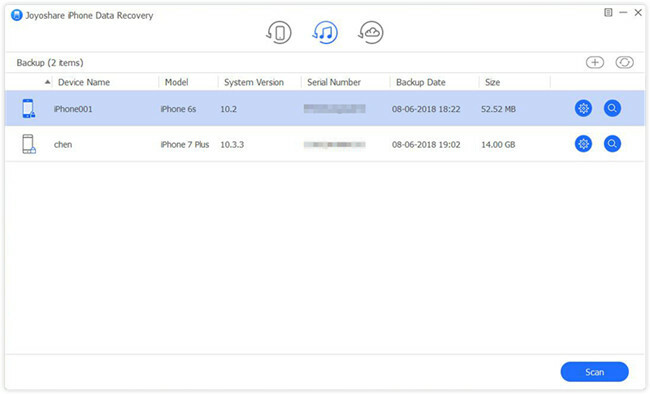 To clearly know quick guide on recovering iPhone 8 data from iCloud, read over the following steps. 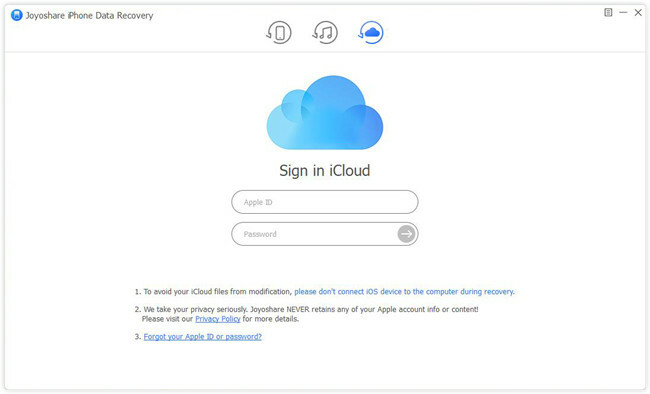 Launch Joyoshare iPhone Data Recovery on your computer and finish logging into your iCloud account under "Recover from iCloud" recovery mode. Don't worry; Joyoshare will not take records for your privacy info and content. All possible iCloud backups will be displayed orderly after you enter your iCloud account. Head to download the most relevant one and select data types that you would like to recover from iPhone 8. Hereafter, press the "Scan" button to fetch data from iCloud backup. 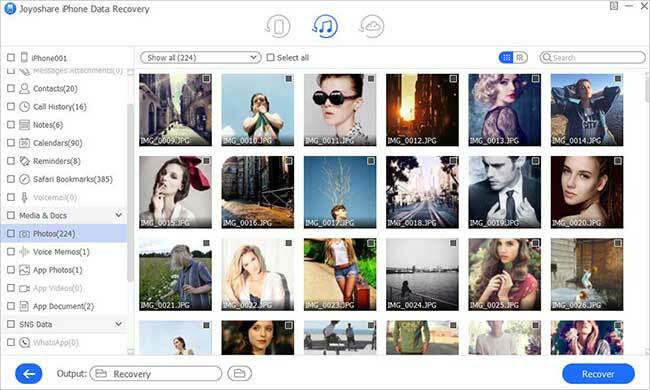 Joyoshare iCloud backup extractor will scan the chosen files as quick as it can and show you all classified data, which can be previewed in real time without problem. Then it's time to select desired files and tap on "Recover" to export them.